The final strategic bombing raid by American B‑29 Super­fortresses based in China occurred on this date in 1945. Targets of Opera­tion Matter­horn, as the bombing of Japa­nese assets by India- and China-based B‑29s was called, were on the Japanese-occupied island of Formosa (today’s Taiwan). Behind Operation Matterhorn was President Frank­lin D. Roose­velt. The presi­dent was impa­tient to resume bombing Japan, last visited by B‑25 medium bombers flown by Lt. Col. James Doolittle and his Raiders on April 18, 1942. After the Casa­blanca Con­fer­ence of Janu­ary 1943, attended by Roose­velt, British Prime Minister Win­ston Chur­chill, and their Combined Chiefs of Staff, the presi­dent dispatched an emissary to Nationalist Chinese leader Chiang Kai-shek to brief the generalis­simo on Allied plans and decisions for the next phase of the war against the Axis powers, including the propo­sal to base long-distance heavy bombers in his country. “Setting Sun,” as the pro­posed plan was ini­tially known, had meta­mor­phosed by the end of 1943 into a com­plex of eight air bases in India and Western China near Chengdu (Chengtu). By April 1944, three months past Roosevelt’s promised start date for the air offen­sive against Japan, just four opera­tional groups of B‑29s from the 58th Bom­bard­ment Wing, XXI Bomber Command under 38‑year-old Maj. Gen. Curtis LeMay, were in place, having been slowed by delays in training air­crews and preparing the new, highly complex aircraft for combat readiness. 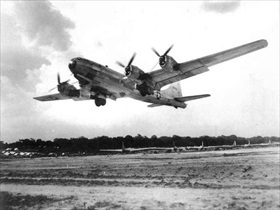 The first B-29 bombing raid from India took place on June 5, 1944. Ninety-eight B‑29s left bases in East­ern India to attack rail yards in Thai­land. Bom­bard­ment opera­tions against the Japa­nese home­land were to be carried out from four forward deploy­ment bases in China—Kwang­han (Guang­han), Kuinglai (Qionglai), Hsin­ching (Xinjin), and Peng­shan. Working against China-based opera­tions was the need to fly all the supplies of fuel, bombs, and spares from India over the Hima­laya Moun­tains (the infamous “Hump”), because Japa­nese control of the seas off the Chinese coast made seaborne supply of China impossible. By mid-June 1944 enough supplies were avail­able at Chinese air bases to launch a single attack against a target in Japan. It was a night­time raid carried out on June 14/15, 1944, against the Imperial Iron and Steel Works at Yawata on Kyūshū, the southern­most Japa­nese home island. The target had been carefully chosen owing to Yawata’s producing more than 50 per­cent of Japanese steel. Toward the end of the year, it was obvious that B‑29s flying out of bases in China and India were far too expen­sive in men and materials and would have to cease. In Decem­ber 1944 it was decided to phase out Opera­tion Matter­horn. In Febru­ary 1945 the 58th Bom­bard­ment Wing redeployed to new bases in the Cen­tral Pacific, thus opening up the last deadly phase of the strategic bombing campaign against Japan. 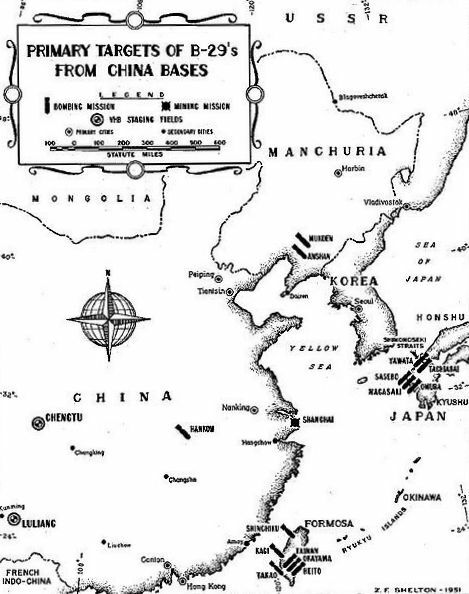 Above: Locations of B-29 bomber bases in China and the main targets they attacked in South­east Asia, including the southern­most Japa­nese main­land, during Opera­tion Matter­horn, 1944–1945. The name Matter­horn came from the moun­tain in Switzer­land, at the time con­sidered a diffi­cult climb. It was thought that once suffi­cient num­bers of China-based B‑29s were avail­able, Japan could be forced out of the war within six months by the destruc­tion of her war indus­tries, making a costly amphib­ious inva­sion of the Japa­nese main­land unneces­sary. Opera­tion Matterhorn, it was projected, could defeat Japan by mid-1945. Left: A 40th Bombardment Group B-29 taking off from an unfinished run­way in Chakulia, India, June 1944. Two months earlier the U.S. Joint Chiefs of Staff approved Opera­tion Matter­horn. The opera­tional vehicle was the 58th Bom­bard­ment Wing (Very Heavy), of which the 40th Bombardment Group was a part. 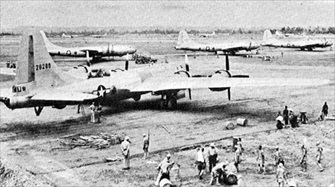 Right: A 40th Bombardment Group B-29 on an unfinished air­field (probably Hsinching Air­field) in China, 1944. Four forward bases in the Chengdu, China, area were assigned to B‑29 operations—Hsinching (Xinjin), Kwanghan (Guanghan), Kuinglai (Qionglai), and Pengshan. Left: On the night of June 14/15, 1944, 47 B‑29s launched from Chengdu, China, to bomb the Imperial Iron and Steel Works at Yawata, Japan. This was the first attack on the Japa­nese home islands since the Doo­little Raid in April 1942. The first B‑29 com­bat losses also occurred during this raid. The city of Yawata was blacked out and haze or smoke or both helped obscure the target. Fifteen air­craft dropped bombs visually while 32 bombed by radar. Only one bomb hit any­where near the intended target, leaving the steel works essen­tially unscathed. Despite inflicting little damage, the Yawata raid was hailed as a great victory in the American press. 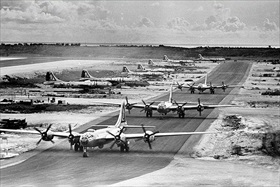 Right: B-29s of the 462nd Bombard­ment Group, West Field, Tinian, Mari­ana Islands, 1945. Another wing—the 314th Bom­bard­ment Wing also assigned to XXI Bomber Com­mand of the Twentieth Air Force—arrived in the Mari­anas and settled in at North Field on Guam. Tinian, Guam, and their sister island Sai­pan were ideal bases from which to launch B‑29 opera­tions against Japan’s major indus­trial cen­ters and, from March 9, 1945, on­wards its major popu­la­tion cen­ters, home to innu­mer­able cot­tage indus­tries. The three islands were about 1,500 miles from Japan’s capital and largest city, Tokyo, a range B‑29s could just about handle. And unlike China, they were on a direct supply line from the United States by ship.